Found my orginal C of O! 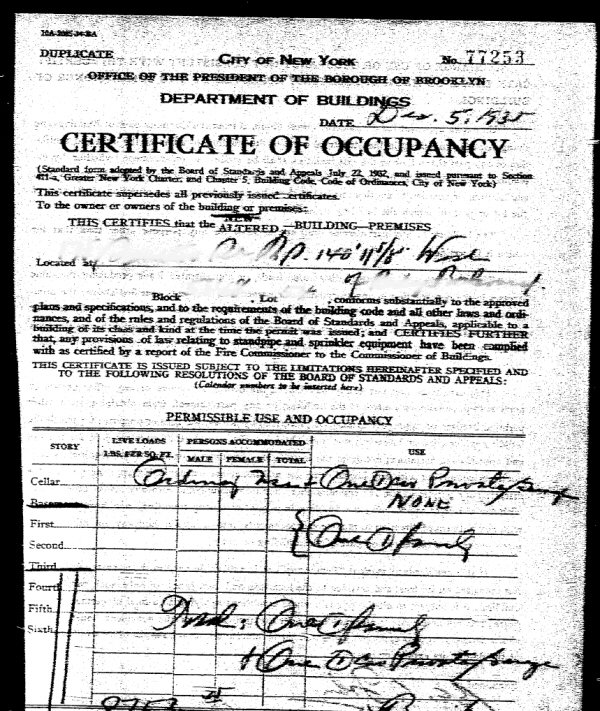 NYC didn't start requiring habitable buildings to have a Certificate of Occupancy (CO) until 1938. Since my house was built in 1906... actually the city recently re-evaluated its records and moved this back to 1901 so I guess I've gotta change my banner here... it was very possible it didn't have a CO. Even though NYC law requires either a valid CO certificate or a "Letter of No Objection" from the Dept of Buildings to be submitted at closing, I never saw one. A housing court judge was quoted as saying, "it is more likely that you will see a yeti crossing the West Shore Expressway wearing a Mets hat than a final certificate of occupancy at a closing." That's why I was semi-thrilled to find the original CO for this place. I wasn't expecting to find it in the city archives but there it is. Apparently, even though COs weren't mandated at the time, if you did any work to a building which required a building permit, your CO came with the successful inspection report. I redacted the address for privacy reasons but it's kinda cool to see my house getting its recognition so many years before I was even born. It answers a question I've had for years: when was my garage built? The answer: it was completed 12/5/1935. So much for the snotty cow on another Brooklyn web site who tried to alibi her recently busted illegal driveway by claiming that my garage was almost certainly a bandit job too. There's my permit, darling.